Air-filled (pneumatic), bones are unique to birds amongst living terrestrial vertebrates. However, it is known that many different types of Archosaurs as well as the birds had post-cranial bones with lots of air sacs. Non-avian dinosaurs in the form of the Theropoda had them to. Whilst visiting the Grant Museum of Zoology and Comparative Anatomy in London, this shared anatomical trait was beautifully demonstrated when viewing a number of avian exhibits. A cross-section of an ostrich femur showing the extensive air sacs. “OSTRICH FEMUR – Birds have honeycomb bones to reduce weight for flight. Flightless ostriches evolved from flying birds and retain this feature”. The above statement is true, but technically (most probably), pneumatic, post-cranial bones have been inherited from the Dinosauria. A close up of the fossil bone shows the typical honeycomb structure indicative of a Theropod dinosaur. The fossil record has provided evidence of pneumaticity in Late Triassic Archosaurs (at least 210 million years ago), it is very likely that air-filled bones evolved much earlier in the branch of the Archosaurs (Avemetatarsalia), that includes the dinosaurs, pterosaurs and birds. Bones with air sacs are also associated with derived members of the Sauropodomorpha. It has been postulated that this characteristic evolved independently in several groups and that pneumaticity did not occur amongst these different Archosaurs as a result of sharing a common ancestor. 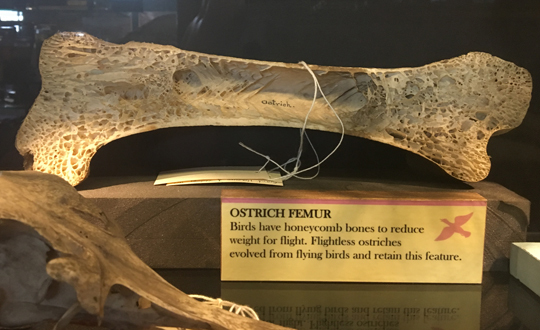 The evolution of light, but strong air-filled bones can be explained for the birds, as such bones would help reduce weight and make flying easier. As for the other, extinct Archosaurs, this characteristic evolved in the Pterosauria (flying reptiles) for very probably the same reason – to reduce weight to make flying easier. 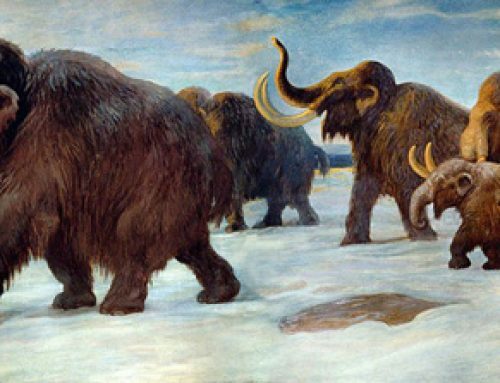 As for the dinosaurs and other largely non-volant Archosaurs that had this feature, pneumatisation might have evolved to reduce energy expenditure as these animals moved about. After all, if you weigh several tonnes, as in the case of a basal Sauropod, if you could evolve a more efficient method of locomotion, than this makes a lot of evolutionary sense.